Q. How Do I Manage Items With Context Tags? 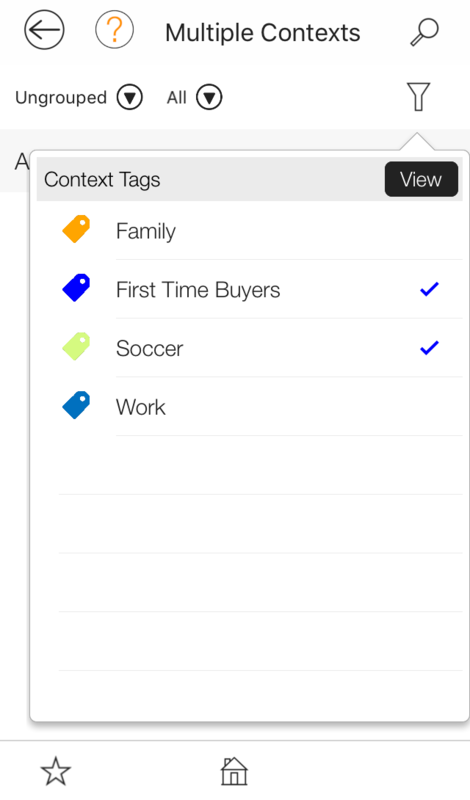 You can add context tags throughout the app by using the New Context Tag view. After tapping a Context tag tile (for the items listed above), and then tapping New, the New Context Tag view appears. Type the Tag name in the Tag field. Tap the Color to identify the tag in the Color field. In the My Contexts view, tap the plus sign (Tap My Contexts and then tap the plus sign). Type the name of the tag in the Tag view. 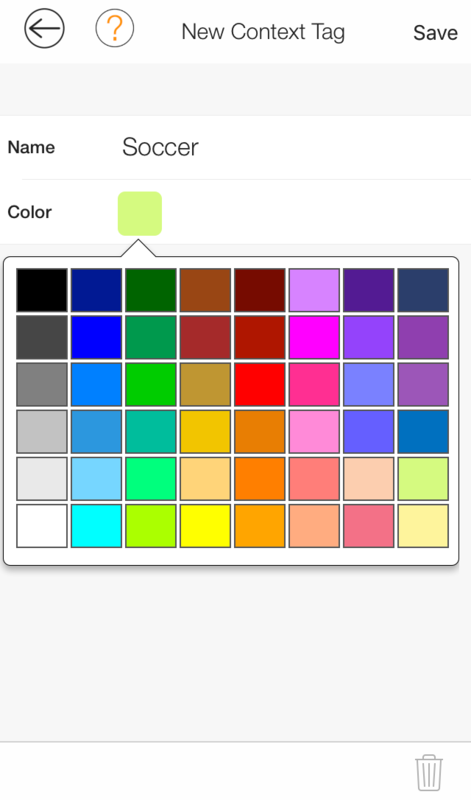 Select a color for the tag by tapping the color field and choosing a color. In the My Contexts view, tap the context tag you want to modify and then tap Configure. Note: You can also tap Color from the expanding cell to change or set the color of the tag. Opening an item, then tapping the Contexts Tags tile, and choosing the tags you wish to apply. Tapping an item, tapping More and choosing Tags, and choosing the tags you wish to apply. Tapping an item, tapping Tags, and choosing the tags you wish to apply. Tap on the View Multiple Contexts tile. Tap on + to add or remove context tags to include. Utilize the grouping and open/closed filters to suit your needs. In the My Contexts view, tap the context tag for which you want to view associated items. The Context view appears, which organizes the items among Type, Undated, and Name. Tap one of these options to view it by type, undated, or name. In the My Contexts view, tap the context tag you want to delete and then tap Delete.